You probably have the proportions constrained on whatever program you're using to make your concepts. Either that, or your simply need to simplify the layer that has your numbers. Once simplified, it should let you manipulate them more. Put the blue pants on the last white with the blue helmet and you have a good uniform. 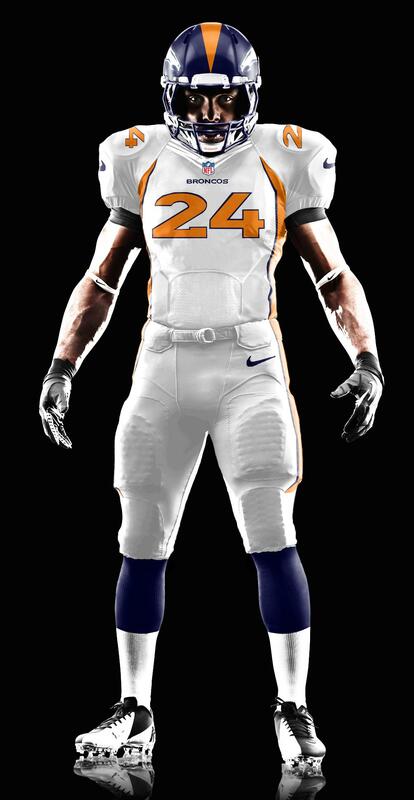 But honestly I think the current whites look fine even though blue is the main color. Even in the orange crush era the broncos had blue numbers. I'm not a fan of color pants on white uniforms. Looks hella tacky. Blue socks, and a blue Nike logo will go a long way in helping balance out the colors while still keeping it primarily orange. Cmon man, I'm not an idiot. The font came squashed and I have three othe fonts just like it all from different places. It won't let me stretch it without also making it wider in the text tool. what program are you using because you should be able to manipulate it easily in at least photoshop? I use gimp and it has never done that before although I'm never create my fonts on gimp for my concepts, I usually use paint or paint.NET for that, you probably have a selection made before you start typing your text and it won't let the text stretch out of that selection, try making the text layer larger or just make sure you don't have anything selected before you start typing the text. Try these man, they are definitely the best sports fonts available. The broncos are included in the NFL folder. I like the swap to orange on the road jerseys, but the blue helmet is definitely best. That's a nice update. Still think they need an overhaul on their striping but that wasn't the intent here I understand.